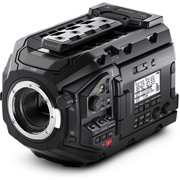 Retaining the familiar form factor of the original URSA Mini, Blackmagic Design's URSA Mini Pro 4.6K Digital Cinema Camera brings expanded control set and increased functionality. The most noticeable difference is the addition of external camera controls. No longer will menus have to be accessed to change exposure settings, activate slow/fast motion, or engage focus assist or other functions. The exterior of the camera also gains a monochrome LCD panel which displays essential shooting data at a glance. Another welcome pro feature is the implementation of built-in ND (neutral density) filters. The four-position wheel switches between two, four, and six stops of neutral density, plus a clear filter for no exposure reduction. Behind the display, two SD card slots have materialized beside the CFast 2.0 slots, enabling more affordable media to be used for less intensive recording formats. The default electronic EF lens mount is user-interchangeable and adjustable to ensure proper flange-focal distance.